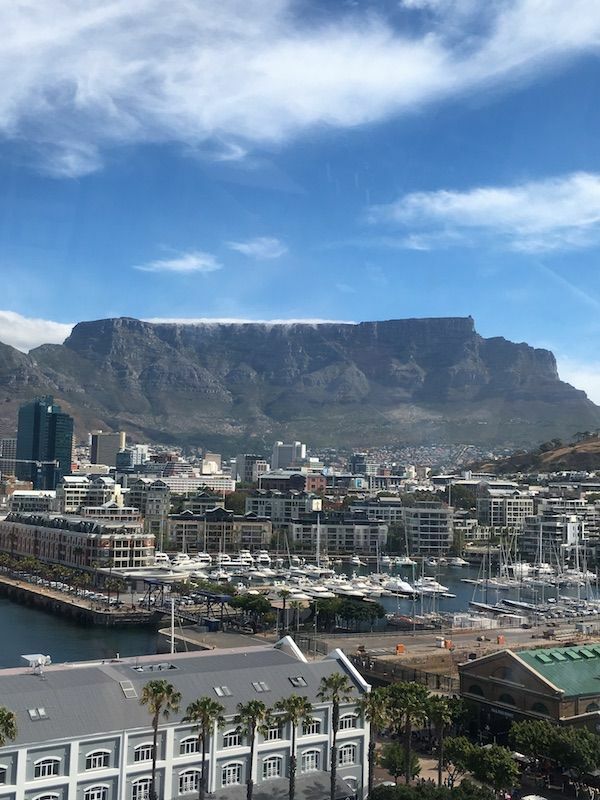 Have you ever been to Cape Town in South Africa? Are you wondering what’s in store for you in The Mother City? There are wonderful white sandy beaches with crystal clear chilly water, spectacular sunsets, iconic mountains, exquisite fish and seafood, amazing wine, flora and fauna. Here are my recommendations on how to explore this wonderful city! Victoria & Alfred Waterfront is one of Cape Town’s main tourist attractions. It’s a busy and beautiful commercial harbour with shops, markets, an aquarium, a maritime museum, a Ferris wheel, theatres, boats, hotels, restaurants, pubs, and live music left and right. It’s a perfect place to spend time browsing around, finding out about tourism offers such as sunset cruises, boat trips, and events taking place. 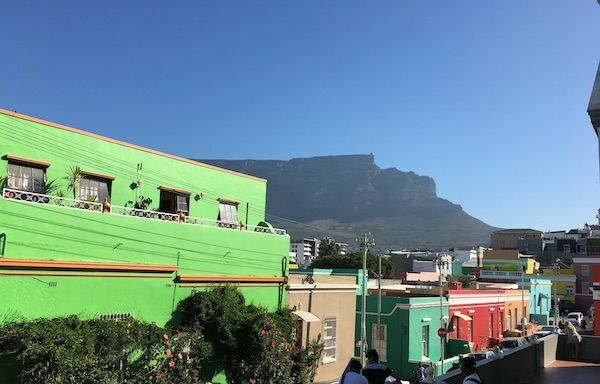 Bo-Kaap, formerly known as ‘Malay Quarter’ is the oldest residential area in Cape Town. A walking tour is the perfect way to explore this vibrant part of town. There are pretty shops, authentic places to eat, and the cobbled stoned streets with the colourful houses are beautiful to see and photograph. 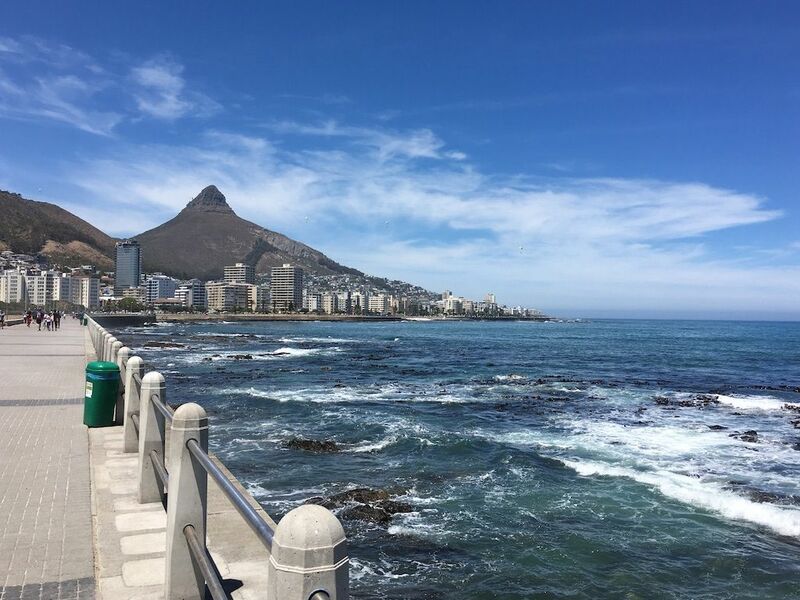 Mouille Point and Sea Point Beach Front Promenade is a path along the water, perfect to walk, cycle or jog. It starts south of the V&A Waterfront and continues along the water until the road ends in a residential area with beautiful houses overlooking the beach. Across the street from the promenade you will find residential buildings, hotels and restaurants. Towards the end it becomes quieter and more residential. It’s a really nice place to see the sunset and watch some surfers enjoy the waves, despite the wind and chilly water. Clifton Bay has four beautiful white sandy beaches which are well protected from the wind due to their location. They are called number 1, 2, 3, and 4, and are accessible through stairs that go down from the main road. Each beach has its own atmosphere, going from small and quiet to bigger and busier. 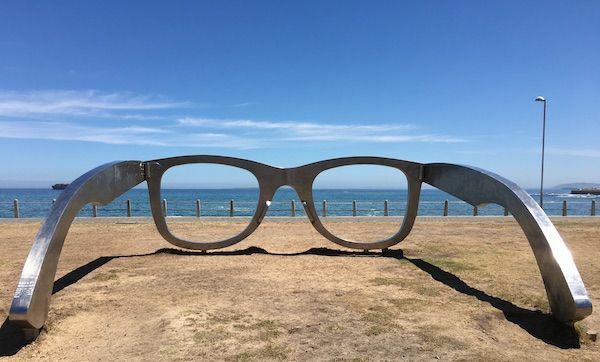 As you get closer to beach four and Camps Bay, it becomes busier and more family style as there are more facilities at hand such as bathrooms, food and drink vendors, umbrella and lounge chair day rentals. Watching the sunset from Clifton beaches is a beautiful experience. Bring a picnic and enjoy it as the locals do. Camps Bay is the long sandy beach south of Clifton beaches. It’s accessible from the main road. There is a strip with restaurants, cafes, hotels and even some grocery stores. It reminds me a little bit of Ocean Drive in South Beach Miami, but without the Art Deco. 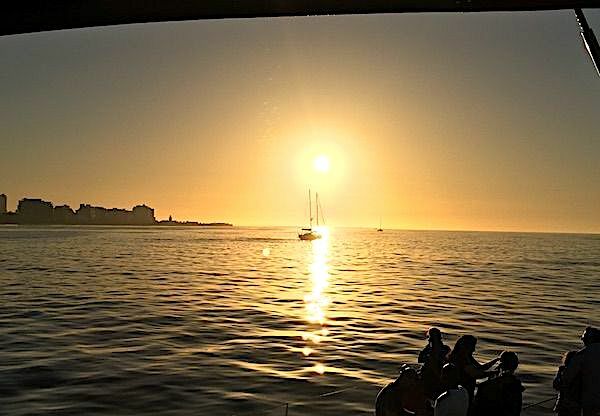 Champagne sunset cruise is another way to enjoy Cape Town’s magnificent sunsets. I highly recommend the sunset cruise at The Mirage departing from the V&A Waterfront. Reserve in advance and be there on time because it gets full and tends to have a waiting list. You will be greeted with a glass of bubbly, settle comfortably in the large boat and set sail for a beautiful trip. Seals, dolphins, the coastline and a spectacular sunset are in store. It is possible to move around the boat to get the best views and to purchase beverages from the bar. However, if this is not your cup of tea, there are many other sunset cruise options to choose from at the V&A. Table Mountain, Lion’s Head and Kirstenbosch Botanical Gardens are must-see places. There are several ways to visit them such as, on your own, hiking, with a guide or in a sightseeing tour…the choice is yours. Going early is always a good idea to avoid long queues. The views are stunning. Groot Constantia is a wine producing farm located about 30 minutes from Cape Town by car. A visit to this vineyard is a beautiful experience. You can see art, beautiful landscapes, history, taste award winning wines, eat great food, pair wine with chocolate, and more. It’s up to you to spend a couple of hours or an entire day visiting, learning, experiencing and relaxing. 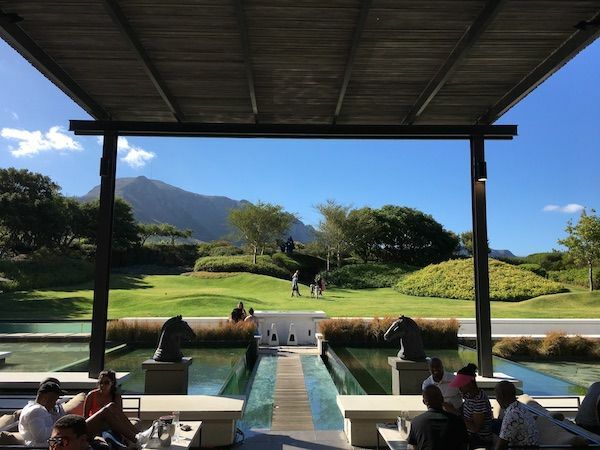 Steenberg is another vineyard which has a hotel, a spa, two gourmet restaurants and a golf course. A visit to do wine tasting and to have dinner is a relaxing and stimulating experience. 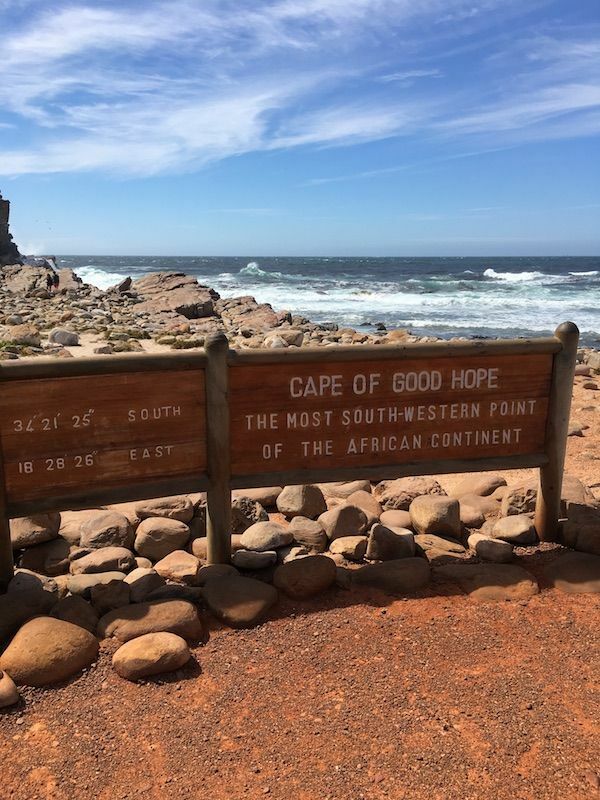 Cape of Good Hope Nature Reserve, within Table Mountain National Park, needs to be in your agenda while in Cape Town. It’s 60 km south-west of Cape Town and the trip by car or by bus has beautiful scenery of the coast, small towns, and even an ostrich farm. Getting there early is a good idea because there is only one entrance to the National Park and the lines of cars get longer as the day goes by. The views from the lighthouse in Cape Point are spectacular. You have the Atlantic Ocean on one side and the Indian Ocean on the other. The flora and fauna within the park are beautiful. Watch out if you have food in your hands – the cheeky Chacma Baboons might grab it right from your hands and eat it in front of you. They are part of the experience. 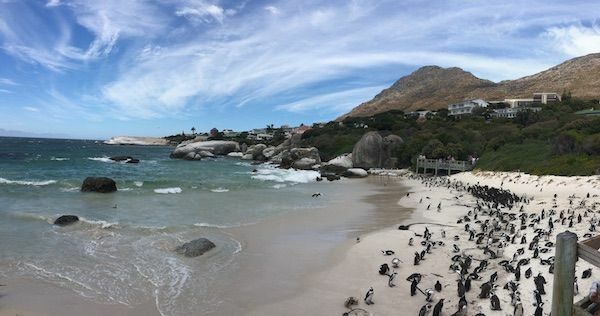 Penguin Colony at Boulders Beach is near Cape of Good Hope Nature Reserve. The beach is protected from high winds and big waves. Penguins started to arrive and settle in the calm protected beach, and today it has become a penguin colony and therefore, a big tourist attraction. There is a nice local restaurant in Simon’s Town called Seaforth, with good fish and seafood. It’s a great place to have lunch after visiting the penguin colony. There are day tours on offer (e.g. the sightseeing red bus.) You may also drive or hire a private guide for the day. Harbour House – probably the best seafood restaurant in the V&A Waterfront. It’s conveniently located next to the water and has an open-air bar and casual restaurant on the top floor. Den Anker – is another favourite in the V&A Waterfront. It’s a Belgian restaurant serving also South African specialties. It has several ambiances, most of which have a view to Table Mountain. Zenzero – in Camps Bay is a really good Italian restaurant, with a cool vibe, beautiful modern décor and beach view. The tables outside or close to the glass doors are great for people-watching, otherwise, the tables inside are perfect for a more intimate meal. Radisson Red – The Red Roof on the top floor is a great place to chill out by the pool, have drinks, grab a bite and enjoy a beautiful view of Table Mountain. Winchester Mansions – is a nice hotel located in Sea Point Promenade. The courtyard of the hotel is particularly nice and worth going for breakfast or brunch on a sunny day. Rockpool – is a casual restaurant in Sea Point with outdoor tables, great pizza and salads, and a fun local atmosphere. It’s perfect for sunset drinks. La Perla – is another good place to have a drink at sunset, lunch or dinner, and enjoy the view of Sea Point Promenade. Harrington’s Cocktail Lounge – is a fun place to go out for drinks, tapas and perhaps some dancing. It has a chic and colourful decoration and live music some nights of the week. They post info. on DJ’s, events, party themes, and what’s going on…on social media @harringtonsct. Mykonos Taverna – is one of the best Greek restaurants in Cape Town. Located on the Main road in Sea Point, it offers authentic Greek specialties in a fun atmosphere. If you go in summer, even if it’s not too hot, do not underestimate the sun. Wear a hat, sunglasses and sun protection. A viser might not be enough because your scalp, even a hairy one, might get a sunburn. As soon as you arrive to Cape Town’s airport, you will be informed through signs, posters, brochures, etc. about the terrible draught they are experiencing. They are trying to save every drop of water because ‘day zero’ (when the city will cut the regular flow of water) is closer than you might think. Even high-end hotels and restaurants are using other alternatives to washing your hands or flushing the toilet. Water taps are shut and sanitiser provided to clean your hands after using the toilet. The use of bathtubs in hotel rooms is highly discouraged and short showers (90 seconds max.) are recommended. Therefore, keep this in mind, be considerate and don’t waste precious water. Click here for more info. I’m an oyster lover and I have to say that the oysters I’ve eaten in Cape Town (from South Africa and from the neighbouring country, Namibia, both from the cold Atlantic Ocean) are among the best that I’ve tried. So, if you like oysters, you must try these. 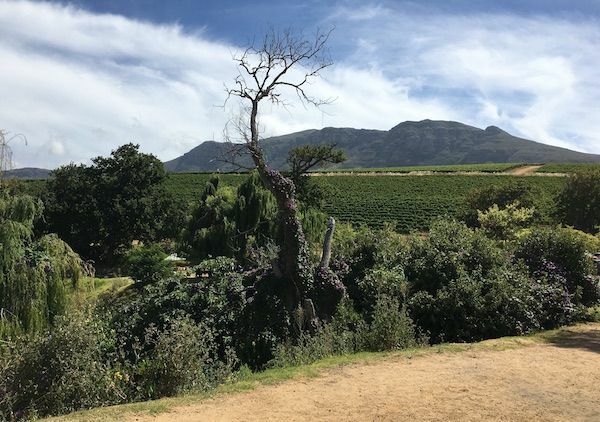 You might be interested to read about a Safari or the wine region of Franschhoek.